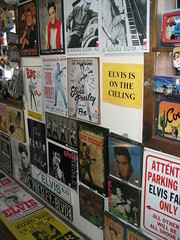 This picture was taken in a small shop in Virginia City, Nevada. They had the most unusual stuff. 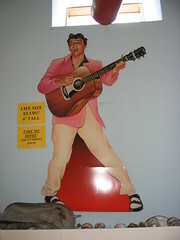 When I saw all the Elvis stuff I had to take pictures of them for Timothy, my 8-yr old little “brother”. May 4 is the official last day of the Spring semester for me, and Fall semester starts sometime end of August. In between that I’m taking a one week intensive summer course on Development and administration of special education programs. I’ll also have to “intensively” work on my qualifier project. I can’t believe I procrastinated so much on that and to make matters worse, someone else published an article that almost answered all of my research questions. I sort of had to reproposed my proposal and I WILL get it done before summer is over. It’s spring now and flowers are blooming everywhere. Pink and white all over. The deadline for Operation Summer Car may have to be pushed back around 2 months. All the conferences expenses and reimbursement procedures is messing up my finances at the moment. Today I attended a session by this Apple senior support personnel who gave what he calls a presale presentation. Bootcamp, Rosetta, parallel-something…it’s amazing how user-friendly some of the applications are. I’m thinking of making a photo presentation with background music and commentaries and then burn it on a DVD and send it back to Malaysia and mom and dad can just pop that into the DVD-player or maybe just podcast it. And if I really have time to spare I can even have a version in Cantonese for my aunt. I’m even thinking of working on some sort of video-modeling intervention for my dissertation. But first I’ll have to get both the hardware and software 😛 And that may be another reason why Operation Summer Car will be extended another 2 months. Oh..the Apple presenter even gave away free iPod Nano……magnets! Last weekend, I went out for run/walks on the Lehigh’s cross-country trail. I even ran a non-stop complete lap (400m) on the rubberized running track. That’s the longest distance that I’ve ran in the past 13 years maybe. Right now I’m planning to take part in the Komen NYC Race for the Cure on September 10th. It’s a 5K run and that means I need to run at least 12 laps 😛 So I have loooooooooooots (each o symbolizing one lap..hehehe) of training ahead of me. 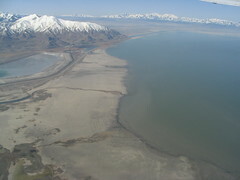 I wanted to go for a tour to the Great Salt Lake, unfortunately there wasn’t enough time to do that. I took this picture just as the plane was leaving SLC. This lake is the second saltiest lake on earth..second to the Dead Sea. Saturday afternoon (April 8 ). 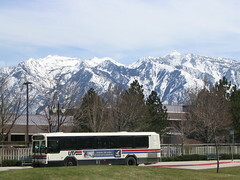 A view of the mountains and the bus that I took. 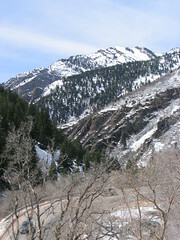 Both Brighton and Solitude Mountain resorts were located in the Big Cottonwood Canyon. This is one of the many pictures I took while on the bus to and from the mountain. 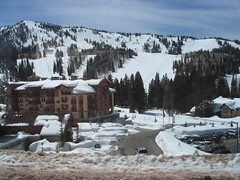 I took the UTA train and bus to get up to one of the ski resorts near SLC. Since they claimed to have the greatest snow on earth I had to see the place for myself. Unfortunately noone else could go with me so I went up alone. This picture was taken when I was on my way down from the Brighton ski place. The ski “resorts” itselves were a disappointment, not very resorty, just lots of cars in the parking lot and a lodge with nothing much. I guess to enjoy a ski resort one would have to ski and sit on one of those chair lifts. I chose to stay at Shilo Inn for several reasons. 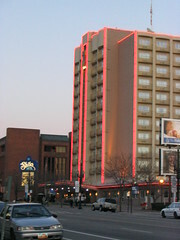 The hotel was located right across the street from the convention center. The room included a refrigerator and a microwave. Complimentary breakfast and free airport shuttle included. Other than those “perks” the room was rather small and unimpressive. However free breakfast was great and I did use the microwave to heat up leftovers. After the trip to U of Utah, we visited the Gateway, a shopping place in downtown SLC. 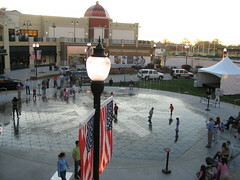 Kids were playing with the water shooting platform. It was quite cold, I’m surprised the parents would let their kids play around with water.